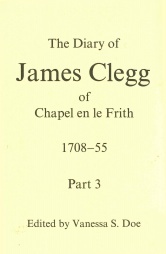 James Clegg 1679–1755 was a Dissenting minister whose congregation came from the scattered hamlets and farms around Chapel en le Frith in the Peak District. He was educated at various Dissenting schools, including the famous academy at Rathmell, in the West Riding, under Benjamin Frankland. H accepted the call to the ministry at Malcoff, a small hamlet a few miles from Chapel, in 1702 in succession to William Bagshaw, the Apostle of the Peak&apos;. The following year Clegg married and later acquired the lease of a farm to support himself and his family. His income, however, remained inadequate and he was advised by friends to take up medicine. He apprenticed himself to a practitioner in Macclesfield and obtained a degree in medicine from Aberdeen University in 1729. As both a preacher and a doctor Clegg was in demand over a wide area. Family matters took him frequently to Manchester, where he was well known in the surrounding towns and villages. In Derbyshire he travelled often to Chesterfield, calling at Tideswell or Castleton on his way, and occasionally continuing into Nottinghamshire or Lincolnshire. He went once or twice a year to Derby and more frequently to Macclesfield, Congleton and Leek. He was in touch, either in person or by letter, with a wide cross–section of provincial society. Clegg&apos;s diary begins in 1708 but it was not until 1727 that he made daily entries. From then until his death in 1755 these entries continue without a break. He gave details of his work for the ministry and the diary provides interesting material on the place of Dissenters in local society. Clegg used his diary to record visits he made to treat the sick. Clegg made reference to epidemics and, where an illness was unusual, to the methods he used to cure it. The diary is thus a good source for the practices of a country doctor of the period. Like all countrymen, Clegg showed an obsessive concern for the weather and state of the crops, and recorded the main events of the farming year. The diary thus illustrates farming practices in this remote upland part of Derbyshire. Although his diary chiefly records day to day happenings affecting his own locality, Clegg shows himself to be well aware of matters of concern in the nation at large. He corresponded regularly with religious leaders in London and the provincial capitals, and was widely read. 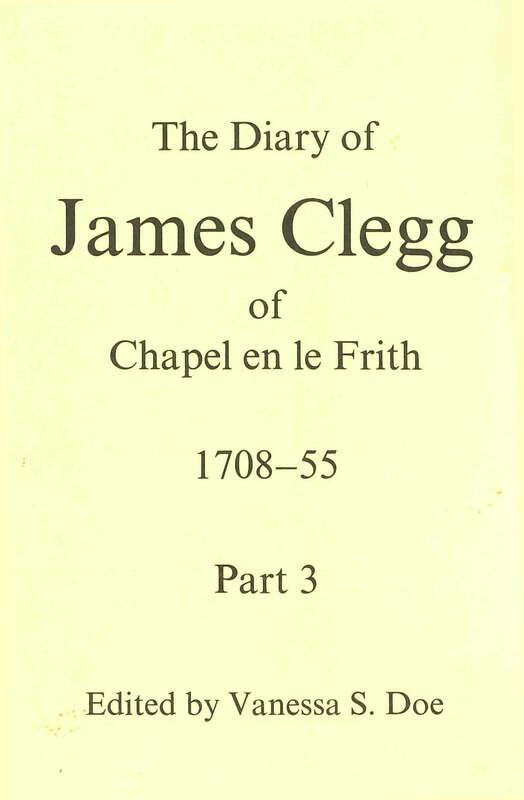 Clegg&apos;s diary is the work of an intelligent, well educated and deeply committed man, and as such provides unique insight into the workings of provincial society in the first half of the eighteenth century.